Recognized by NORTH TEXAS POLICE Departments for our achievments in deterring mail theft. Identity theft is the fastest growing crime in the United States today! More than 10 million people fell victim to identity theft last year; on average each victim’s loss was $800 and it took more than 12 months to clear their name...and that's not even taking into account all of the never ending phone calls and piles of paperwork each victim has to suffer through. Many people who are victims of identity theft often think they were victimized by sophisticated high-tech Internet hackers who somehow compromised their computers. 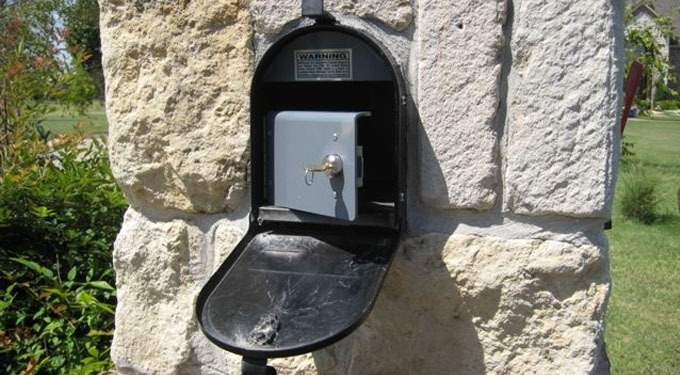 In reality, it is often a thief who simply removes key information from your curbside mailbox when you are at home, work or at the store it takes exactly one second to reach inside your mailbox and remove the contents. - The BEST access to your mailbox from any locking mailbox system – no other product on the market allows mail carriers to have total access to your mailbox during delivery. - Gray DoorTM locks automatically after mail carrier has delivered your mail; your mail carrier simply needs to shut and push the Gray DoorTM closed. Gray DoorTM protects your mail until you unlock your Gray DoorTM. - Mail Carriers never need a key and they still have full access to deliver your mail. - Gray DoorTM is constructed of a rugged, high-impact, composite plastic so it will not rust and it is maintenance-free, heavy-duty, weather-sealed while also having an elegant design. - Gray DoorTM has been independently tested for function and durability. - Each of our standard-size inserts comes with 2 keys. Installation is available at an additional charge of $40.00 for those living in Collin County -- Texas. Please contact us via email or phone to setup your installation time.